Evocation – “the act of bringing or recalling a feeling, memory, or image to the conscious mind; the vivid evocation of stillness in the title poem”. 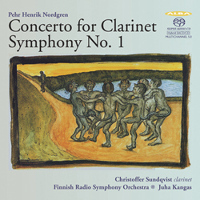 This Alba title word introduces Finnish composer Pehr Henrik Nordgren (1944-2008). Nordgren left a legacy of 8 symphonies, no less than 25 concertos for diverse instruments, 11 string quartets and much else. He wrote more for the string orchestra than any other Finnish composer. Largely self-taught, he was fiercely proud of his independent approach to composition, never being wedded solely to one theory or style of composition. 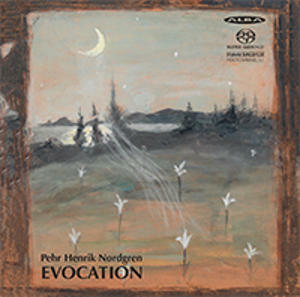 Deeply interested in Finnish folk music and instruments of all types, his sound world develops from superimposition of many melodic strands, a "melodic-polyphonic cluster technique" as he called it. Twelve-note tone rows were also used as a feature. 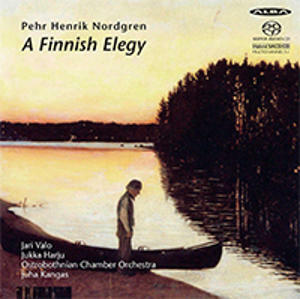 An important factor in Nordgren’s career was his strong association with the world-worthy Ostrobothnian Chamber Orchestra, which was rooted in Kaustinen, a small town known as the seat of the Western Finnish folk tradition. It was here where he and his wife settled for the rest of their lives. 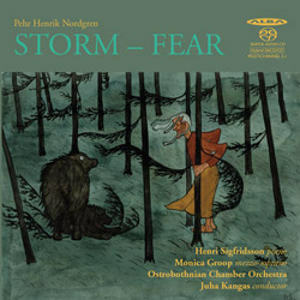 Nordgren was soon collaborating with Kanga’s Chamber Orchestra, and is now regarded as the leading Finnish composer in this field. The Ostrobothnian also provides the Kokkola Quartet, formed in the ‘80s.The present quartet is Reijo Tunkkari (first leader), Annica Brännkätt (associate leader of the second violins), Hanna Palakka (principal violist) and Lauri Pulakka (first cellist and programme coordinator). Turning to the first piece of ‘Evocation’, String Quartet No. 3 op. 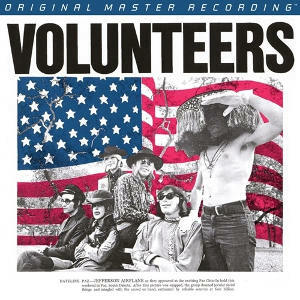 27 (1976) has only one movement, but is a World Premiere Recording. Technically, it begins with a whole-tone interval motif (A flat – B flat) which develops into a tone row based on the tri-tone; these can be recognised throughout the Quartet. Emotionally, the beginning motif is soft and lonesome in playing, until a shocking loud and raspy chord from a violin stirs up and increases the tension and initiates deep wandering until string pizzicatos slap coarsely on violin necks. Polyphonic interweaving by separate strings and part of folk-tune follow, then the whole tone interval returns and the piece finishes in a descendent to silence. 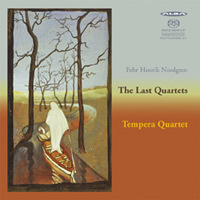 Five years after the 3rd string quartet, the gripping “Equivocations” for kantele, Op. 55 (1986) appeared. This brought in the Finnish plucking-instrument of ‘kantele’, with a trio of violin, viola and cello. Nordgren had emphasized that there should be “no trace of folk music”, in the work, but in the case of “Equivocations,” the kantele was to be associated with the Japanese koto, as was several of his works. In my view, the apex of this programme is the Sonata for Solo Cello op. 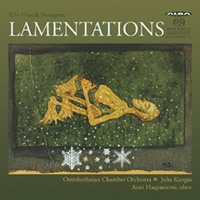 83 (1992), another World Premiere Recording, played by Marko Ylönen, Professor of Chamber Music at the Sibelius Academy since autumn 2009 who has been required world-wide for recitals. 1.Poetic, 2. Defiance (virtuoso), 3. Interlude; Oreiller (“pillow” in French, quiet, shows wide range) and 4. Patch or “beauty spot”. Such titles speak for themselves! As well as a superb technique, Ylönen has a deep understanding of Nordgren’s styles, a variety of techniques to convey these feelings — dodecaphony, Ligetian field techniques, aleatoric counterpoint, free-tonality, minimalism, and Finnish and Japanese folk music. For the solo cello sonata, Nordgren wrote a significant programme note, which is printed in this Alba booklet. Finally, a String Quintet from the Kokkola Quartet (op.110) with the addition of Janne Virkkala (second principal cellist in the Ostrobothnian Chamber Orchestra). Premièred in 2000 for the Kimito Island Music Festival, Nordgren had developed a special interest in ancient Karelian and Ingrian folk melodies. There are two movements only. 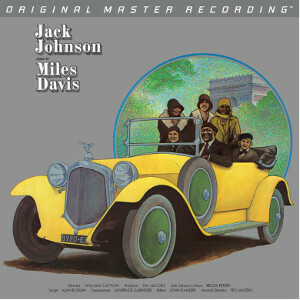 The first (5:36) was designed as an introduction, with the second body of the Sonata starting at 12:34. The two cellos use their extra deepness and richness, even sounding like an organ in places, but they finally are dark and agonised. Snellman Hall, Kokkola, was the site, the Hall which was finished in 1981. The Ostrobothnian Chamber Orchestra, as well as many Finnish top recording artists, performs regularly at the Music and Event Centres. 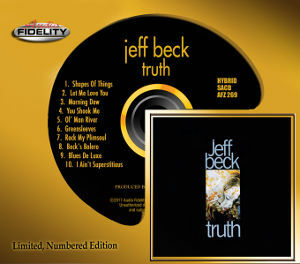 Produced, engineered and edited by the well-known Simon Fox-Gall was at Snellman, but the 5.1 mix and SACD mastering was done in London by Jonathan Stokes. Overall, Fox-Gall’s engineering is crystal clear, intimate and realistic in the myriad timbres which the Kokkola group can produce. There is a fine bloom to the strings, and the overall acoustic is unobtrusive and produces a very convincing 3-D image of the various chamber string groups. A multichannel 5.1 ability deepens the two cellos. Production is also done very well, from the cover painting by Hugo Simburg (1875-1917), “Landscape in Moonlight” (which shows much about Nordgren’s life), to the English and Finnish overall commentary by Lauri Pulakka. There are photos of Kokkola Quartet and the two soloists but it is a unfortunate that there is none kantele . Alba’s ABCD 41 is a fine presentation of another set from Finland’s Nordgren. In 1976 he said “Music is not an isolated,‘made’ phenomenon, and thus composing cannot be separated from life, from everything that one sees and experiences and feels. I see composition as a manifestation of a need to express, broader than speech, a mode of communicating with my fellow men.” Who can avoid such a realistic manifesto of his music, indeed all music?